The team here at Coggin Nissan at the Avenues pride ourselves on our customer service! We go above and beyond to give you the coggin experience. Don't just take our word on it, read below and see what our recent customers have to say about their time with us! 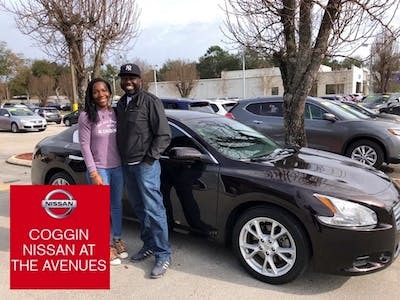 So I just financed a 2017 Nissan Altima I had great experience with Kyle he wasn’t too pushy, he listened to what I wanted and got me exactly that. I would recommend This location to anyone I am so happy with my new car! Vladimir is helpful, thorough, and a pleasure to work with. They make sure you're happy and comfortable after the sale. Would recommend to others. Kyle was professional, courteous, and knowledgeable about the vehicle we wanted. He was able to find exactly what we wanted. We absolutely love our Titan! I found the vehicle I liked on Car Gurus, and called Vladimir who immediately made me feel comfortable.once I arrived, i was greeted by him on his day off.he was patient and helped me become familiar with the vehicle. The paperwork went smoothly and I was out the door in a short period of time. We are very happy with the deal we got and even happier with the way i was treated! I would give my highest recommendation. I bought my Versa here in 2011 and had great service then and now. A customer for life, just don't change the way you do business. Excellent service my sales person was one of the greatest I had ever worked with the customer service helped with children while I was doing paper work my thanks to all . 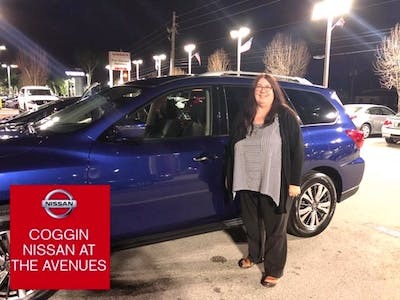 When I walked in Vladimir asked if I can help you with anything?I said yes, I would like to take a look at that 2015 Nissan Pathfinder SV. He got the keys just walked out with me to start showing that Pathfinder and what It was able to do and sold me on it. Vladimir Voloshin Is real professional and an asset to Nissan. This was my seventh vehicle purchase from a Coggin dealership. The salesman, Kyle, was extremely helpful and polite. I chose my vehicle from the website and locked in my price. Jimmy, the financial representative who assisted me, was knowledgeable and worked hard to keep my payments where I needed them be. There wasn't a lot of running back and forth for pow wows with managers. 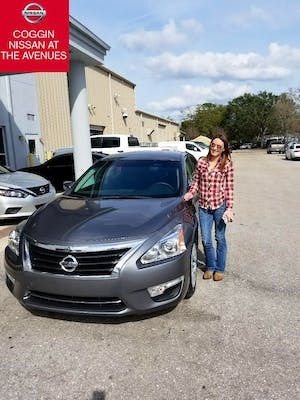 This is my 2nd Nissan purchase from Vladimir, and like the 1st purchase, my 2nd purchase experience was excellent... Thank you to Vladimir for another great experience! Great selection, options and service! My car salesman was thee best, thorough and honest! The work was efficient I was in and out within 2.5 hours, loved my experience! I have never experienced a sales person who was so professional, he made us feel like family . I highly recommend going here to buy a car our salesman made this purchase so easy and was so knowledgeable I would definitely do it again and again. Purchased my son a car, it was a great experience with Dave and George. They were knowledge and extremely accommodating working with him for his first car. 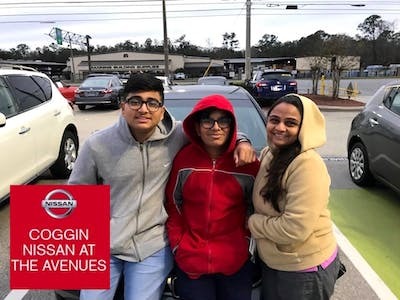 Good experience at Coggin Nissan at the Avenues. 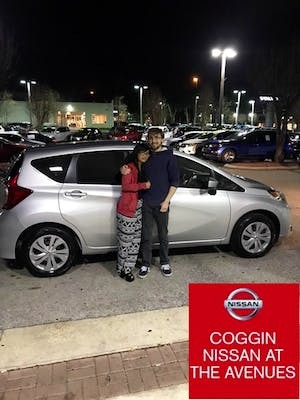 I worked with Kyle Smith in Sales who was very helpful in explaining all of the features and benefits of my new car and made sure I had a good understanding of everything before I left the lot in my new ride. Ryan Shapiro in financing was great as well. Very friendly and professional all around. I would recommend this dealership and would return here again to buy another car in the future. Patrick, David, and George were awesome! They all helped me get into the perfect car for me!! They made sure all my wants/needs were in this vehicle!! Thank you guys so much!!! I enjoyed working with Vladimir. Good follow-up. No pressure. Got a great car at a good price. would recommend to others looking to buy. Robert and George were absolutely amazing to work with. Made our deal short and sweet. Super glad we decided to drop in after a deal gone wrong at another lot. Thanks guys! Such a warm person, sincere and genuine. Helped get what I needed. Really needed an SUV, he made it happen.Thank you so muchVlad and Ryan! HIGHLY recommend this dealership! Everyone treats you like a person and not a price tag! Was able to get in a 2015 Altima for what I was looking at (payment wise) David and Phillip are awesome!!! IF I decide to get a new vehicle which won’t be for a long time I will definitely be going back to Nissan at the Avenues!!!! Buying my first car was fast, easy, and helpful. The person customer service made for a great experience. Great people. Great experience. Highly reccomend to everyone!! Offers more amenities than most other service centers and is often less than I expect to pay. Also bought my car here, nice friendly sales people that want what is best for the customer. The experience is one I will never forget. The Sales Consultant & Financial Manager were in formative/descriptive regarding the car & was able to answer all questions & concerns. Thank you!!!!! Our sales representative was extremely helpful and a very patient man when I couldn’t decide on the color I wanted. I would give him an At rating and plan to send customers his way. Thanks Nissan. Also the finance person was great. Rich put me in an great vehicle that was in our price range! He was also extremely personable and courteous. There were also lovely refeshments while we waited to speak with the financing team. He was very engaging and honest. He made it an easy process and respected my time and i appreciate that?? The only feedback i have is in regards to forcing people to use 25 words before they are able to this submit the survey. No need for the restriction, the bottom line is, Vladimir is an awesome sales man, what else is there to say? Kyle was such a nice salesman to work with. I have dealt with my fair share of used car dealers, and you always leave with a bad taste in your mouth. Kyle seemed to want me to find the right car that would make me happy. Very good experience! I enjoyed searching for a car! Very good salesman he was extremely helpful and friendly! He genuinely cared about helping find the right car for me! No rush and no push! All he wanted to do was help! Would recommend to all! From walking in the door to driving away in my new vehicle it was an overall great experience. My sales associate was easy to work, well informed, and extremely helpful. 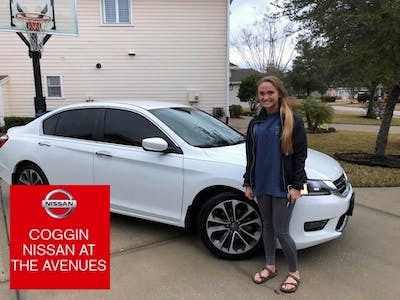 Coggin Nissan at the Avenues made purchasing a new vehicle simple, and without stress. 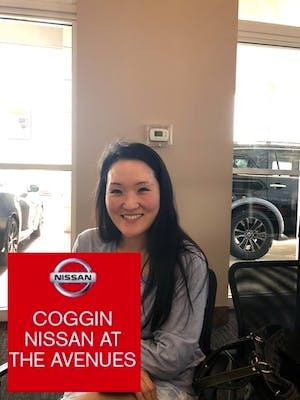 Coggin Nissan is a great place to shop for a vehicle. The staff is friendly, well trained and willing to go the extra mile to ensure that the customer is satisfied. Thanks Kyle Smith for a great car buying experience. I was that “difficult” customer. Kyle was very patient in listening to and understanding my sometimes unrealistic needs. He did a great job in helping me determine the right vehicle for me. Everyone at the dealership was attentive & friendly with no pressure. Love my new-to-me car!!! Everyone was helpful, especially David in sales and George in finance. Ron, the General Manager, has an unbelievable team! Best car-buying experience by far. Vladimir was very patient/professional and he displayed great empathy and understanding! Clearly I was very undecided but Vladimir guided me to the finish line. If you are looking to purchase a vehicle go see Vladimir! They did not have the vehicle I wanted on the lot and Vladimir went above and beyond to find my vehicle and have it delivered to the dealership. First class service!!! Kyle was such a easy person to work with. He knew exactly what we were looking for and went above and beyond to provide great service and I would recommend him to anyone in the future. I really liked the special touches he didn't like but a personal photo on the display screen in my new accord. Plus he put an extra effort to find the car I was looking for all the way in Orlando. He is definitely a asset to Coggin Nissian. These guys are awesome ! Great dealership and service dept. Always have great service and friendly people. Got a great deal and professional service from Vladimir. Was shown what I asked for after understanding my requirements. I moved recently to the U.S. and had limited financing options, we discussed my options clearly and arrived at a reasonable solution. Would highly recommend this place.. Went in there to see our options to upgrade my wife’s car and we decided to change both cars as the deal they got us was too good! It is now cars number 3 and 4 that we purchase from Vladimir and he always takes good care of us. He is one of the best dealer I got till now. I will definitely buy my next car through him. Go with him if you want good deals. 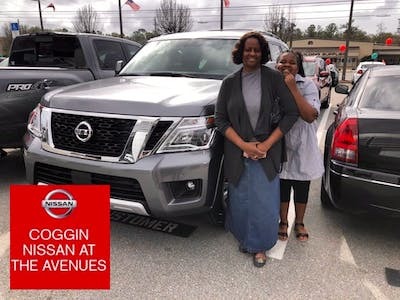 My husband and I visited several Nissan dealerships in boh Atlanta and Jacksonville and had a positive experience at each of them. We were shopping for a used Murano after my Sentra was totaled in an accident. 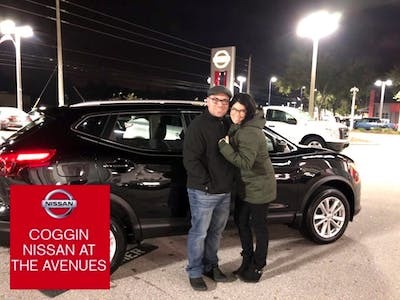 Kyle Smith at Coggin Nissan at the Avenues broke all stereotypes of car salesmen and made the buying experience pleasant, not rushed, and stress-free. He was not pushy and gave us all the time we needed before finally deciding to purchase a vehicle.